Mac three function touch stylus pen. 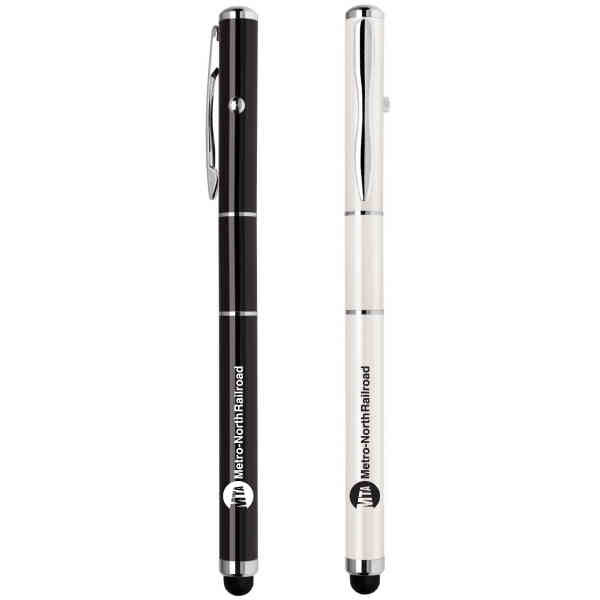 3-in-1 multifunctional stylus, laser pointer, and ballpoint pen. Brass constructed body that comes in Glisten Black or Pearl White. Twist-off upper body contains laser pointer while lower body contains ballpoint pen. Compatible with all capacitive touch capable devices such as the Samsung Galaxy, Blackberry Touch, etc. Size: 5 1/2 " x 1/2 "
Price Includes:One color, one location imprint or laser engraving. Imprint Size:5/16" x 1 1/2", 5/16" x 11/16", 5/16" x 2", 1/2" x 1 1/2", 1" x 11/16", 1" x 2"